The protective container with Sentinel-2B emerges from the cargo jetliner during unloading activity at Félix Eboué International Airport near Cayenne. 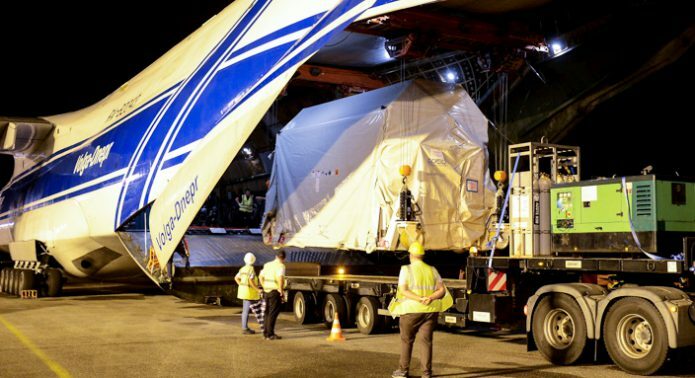 Sentinel-2B has touched down in French Guiana, bringing the second satellite for Europe’s Copernicus program closer to its early March orbiting by Arianespace on a Vega lightweight launch vehicle. Arriving at Félix Eboué Airport near Cayenne last week, Sentinel-2B was delivered by a chartered Antonov An-124 cargo jetliner. Following its unloading process, the satellite was readied for transfer by road to the Spaceport. As a follow-on to Sentinel-2A – lofted by another Vega in 2015 – this latest spacecraft will become part of the European Union’s Earth observation satellite fleet called Copernicus. The program’s goals are the provision of information for agricultural and forestry practices, assisting the management of food security, tracking pollution in lakes and coastal waters, along with delivering disaster mapping and helping humanitarian relief efforts. The Sentinel-2 satellites result from a close collaboration involving the European Space Agency, the European Commission, service providers and data users. The mission was designed and built by a consortium of some 60 companies led by Airbus Defence and Space, with support from the CNES French space agency to optimize image quality and by the DLR German Aerospace Center to improve data recovery using optical communications. Since Arianespace’s launch of Sentinel-2A in June 2015, the forerunner spacecraft has been providing imagery for the European Union Copernicus Land Monitoring Service and others. After Sentinel-2B is orbited by Arianespace on Flight VV09 – signifying the ninth mission performed by the lightweight Vega launcher – the satellite constellation will cover the globe every five days.